Adding thermal mass to a building — CoolZone ceiling tiles contain a phase-change material. Adding thermal mass in the form of a phase-change material can help designs comply with the requirements of the Priority Schools Building Programme as Tony Heslop of BASF explains. In February the Government published details of 277 schools that will be rebuilt or refurbished under the £2 billion second phase of the Priority School Building Programme (PSBP). Launched in 2011, the PSPB heralds a new era for school ventilation design — with draught-free ventilation now mandatory, an expectation that passive cooling using thermal mass will be included in a school design, and the need to comply with a facilities output specification which includes criteria to limit overheating in schools. The PSBP is the successor to the Building Schools for the Future (BSF) programme. Under the BSF, schools had to comply with the demands of Building Bulletin 101, which included the requirement that there was sufficient fresh air for pupils and that the schools did not get too hot in summer. However, a study by the BRE for DfES looked at eight naturally ventilated schools and found that in winter half did not open windows for fresh air because the air was too cold. There are also reports that many of these schools have heating bills significantly higher than had been predicted. The PSBP sets out to tackle these issues. 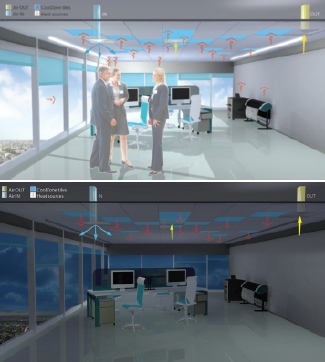 To improve occupants’ thermal comfort in winter, designers are no longer allowed to bring in cold air from outside directly onto the occupants; instead the air has to be mixed with enough warm air to mitigate any cold draught. To prevent overheating in the summer, the PSPB introduces the concept of operative temperature as a way of defining occupants’ comfort. These graphics of Picture of Belvoir school interior illustrate heat exchange across CoolZone tiles containing phase-change material during night time and day time. Operative temperature is a function of air temperature, humidity, air speed and the temperatures of the surfaces to which the occupants are exposed. A critical aspect of the new rules is that the maximum internal temperature in a space is allowed to vary, depending on the maximum outside temperature of the last seven days — termed the running mean temperature. Designers have to use the internal operative temperature and the running mean temperature to prove compliance with a new set of overheating criteria. These define the following. • The number of hours a day above an allowable maximum temperature, multiplied by the number of degrees above the allowable maximum. • A maximum value of 4 K for the indoor operative temperature above the running mean temperature. A design must pass two out of three of these criteria. Thermal mass, a material’s resistance to change in temperature whilst exchanging heat with its surroundings, is an important tool in helping designers to meet these criteria. Surfaces with a high thermal mass, such as exposed concrete walls or soffits, can absorb and retain large amounts of heat to keep a space cool. This heat can be released at night using night ventilation to recharge the thermal mass ready for the next day. An effective way to maintain a comfortable temperature in summer in a classroom with a lightweight construction is to increase the thermal capacity of the structure. One of the most efficient ways to add thermal mass is through the addition of phase-change materials to the internal surfaces of a room. What makes phase-change materials (PCMs) so special is that they utilise the latent heat of solidification or melting and hence can absorb far greater amounts of energy than an equivalent conventional material. They have the ability to change phase at room temperature, usually from a solid to a liquid and back again. BASF’s Micronal PCM, for example, comprises thousands of microscopically small polymer encapsulated spheres, each with a wax core developed to make use of latent-heat storage. Since melting and solidifying happens inside each microcapsule, the material remains solid even if heat is being taken up or released. BASF’s Micronal PCM has been incorporated into various construction products, including plasterboard and ceiling tiles. Phase-change material embedded in ceiling tiles has been successful in reducing room temperature to pass the output specification criteria. Armstrong Ceilings’ CoolZone tiles make use of Micronal PCM. In the tiles, the micro-encapsulated wax has been developed to melt as the room air temperature approaches 23°C. As it changes phase, the wax soaks up heat from the room — a process that continues until all of the wax has changed phase. At night, with the use of night ventilation, the tiles can then release this absorbed heat once the room temperature starts to drop below 23°C. As it releases heat, the liquid PCM returns to its solid state. Armstrong Ceilings worked with natural-ventilation specialist Breathing Buildings to develop an integrated system incorporating CoolZone ceiling tiles and Breathing Buildings’ e-stack ventilation system to enable designs to meet the PSBP facilities output specification. On a summer day the system will work in two phases. Firstly, in the morning the stack ventilation system will operate in conjunction with manually opening windows to exploit free cooling from the outside air. Once external temperatures rise above internal temperatures, the windows are closed and the system will switch to minimum ventilation based on CO2. In this mode the PCM incorporated into the CoolZone ceiling tiles will absorb heat from the room, helping keep the occupants comfortable. The second phase is at night, when ventilation allows cooler night air to remove the absorbed heat from the PCM, re-charging it ready for the next day. The system was successfully tested at Belvoir High School in Nottinghamshire where two classrooms with suspended ceilings and a Breathing Buildings e-stack ventilation unit were compared. For the test 20 m2 of conventional ceiling tiles were replaced by CoolZone tiles in one of the classrooms. 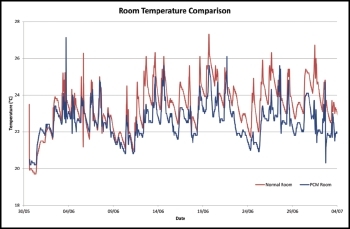 The results show (see graph) that when the rooms were occupied during the day, the room with PCM embedded in the ceiling tiles was generally 1 to 2 K cooler than the room without the PCM. The tests demonstrated that the room with 20 m2 CoolZone tiles was able to pass the output specification criteria. This installation represents one of the first fully tested applications of our Micronal PCM technology. It is an important step forward to see the innovation being used by Armstrong in its ceiling tile. We look forward to further developments using our chemical innovations in a range of building products.